Formula Fusion takes the breakneck speeds and acrobatic track designs of WipeOut, with all its loop the loops, corkscrews, and jumps, and adds to it an upgrade system, which sees you conscripting futuristic universities to research new gear for your car. Fusion even has some of the original WipeOut team working on the racer. The story goes that in 2025 most of the world is going to be wiped out in a nuclear war. It will take 50 years for civilisation to rebuild and, in that time, the wealth gap between rich and poor will widen to extremes. Out of the ashes vast universities will form. These mega academies will be the size of cities and employ most of the population. However, silver lining, this post nuclear war society will be big fans of WipeOut and so sink all their money and resources into developing anti-gravity racing. 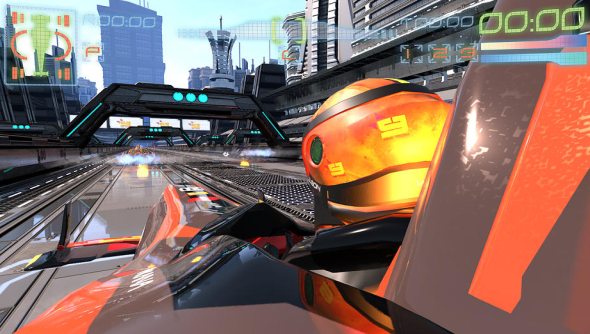 The developers say that “the amount of speed you can gain is potentially open-ended; to the point of having an almost warp speed like quality.” In the later WipeOut games, like 2048, Sony Liverpool built a stripped down game mode called Zone. As you raced you got faster and faster until you were travelling too fast for the circuit, nothing slowed you down except for hitting the walls which damaged you. Even Zone had an upper speed limit, though. For the brave among you, R8 Games are adding a first-person “‘in-cockpit’ F1 VR style” view to the mix. R8’s made up of ex Wipeout, Colin McRae, AutoClub Revolution, Carmageddon and Midnight Club developers. A Thumping Urban Soundtrack – From DubFX and CoLD SToRAGE.